We have no doubt that this impressive new listing is going to prove to be a popular addition to the local property market. Set within a prominent town centre location, boasting rear garage and private off-street parking along with 3 well proportioned bedrooms and 2 reception areas this charming end of terrace requires your immediate attention. Tastefully presented with many touches of character throughout, this unique property will appeal to a vast array of purchasers and even has investment potential for those considering adding to their property portfolio. Given the presentation, location and accommodation on offer, we as selling agents highly recommend immediate viewing on this unique home. 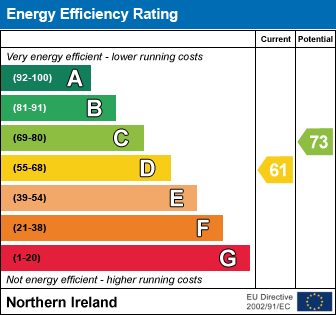 I am interested in 57 High Street, Ballymoney. Please contact me about this property.